Yesterday, I was feeling very much influenced by others. My attention and heart were pulled all over, thoughts boiling up and popping around like popcorn in my head. I found myself trying to look at the positive side, trying to be present. I was trying at my own cost. It hurt. Physically, emotionally, mentally. Overwhelmed with the process of it all. I was hurting and felt that there was no one to receive that. When someone’s actions indirectly cause pain, it is something to look at and try and understand. Assuming they weren’t intentionally causing harm, the pain is not directly from them. It’s a response to a condition. So, how do you express that you are hurting while knowing it’s not their fault? When do you do it? Should you do it? Is it valid? These are the questions and doubts that went through my head, along with many others. Sifting through what was conditioned and real exhausted my mind and emotions. I meditated first thing in the morning, and I wasn’t able to empty the bowl of popcorn. The heat was still there, new thoughts coming up, and so many kernels to digest. It has been hard to breathe for a few days now, just like before. I felt a band of tension from my left cheek, down across my heart, and to the bottom of my ribcage. I wasn’t able to release it, but very aware of the band across my heart. Sifting through the doubt, I allowed myself to feel what came up. Being upset is okay. I talked later that day with one of my therapists, and she validated my feelings, all of them. As I sat there, telling what I was thinking, I started sobbing. I hadn’t allowed myself my feelings for fear of being a “wet blanket,” for fear of seeming weak, un-evolved, etc, etc. She let me cry, let me express exactly how I felt without judgement, and it became so clear to me that I was not allowing myself to be as I am. I needed to express my authentic self, without reserve, without apology. At the end of the session, the little green anole that usually lurked around during our sessions jumped onto my foot! Interestingly, the sensation didn’t alarm me, and I was so happy to have him there. My therapist was excited, for she feels that animals enter our lives in symbolic ways when we most need the message, and when we are aware. That which we call a chameleon in the United States is usually not a true chameleon. Growing up, I remember going to the circus and seeing them sold. 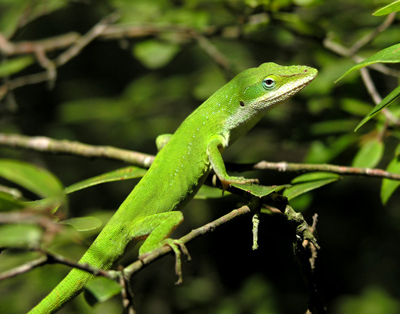 In the US what most people refer to as a chameleon, is actually an anole. The chameleon has a third eye, located on the back of the animal’s head, and it blends perfectly with the body. It does not see in the sense of the other two eyes, but it is capable of distinguishing light and dark. For those with this totem, new awareness of their own psychic ability and intuition is being awakened. There will be greater ability to recognize when it is functioning and when it isn’t. A chameleon does not actually blend into its surroundings. It is already the natural color of its normal habitat. It does change color in degrees, according to temperature, humidity, and even emotions. When frustrated or angry, it turns brown. When happy and/or contented, it turns more of a light green. This reflects a sensitivity to the environment. Those with this totem will find their own sensitivity to the environment and other people increasing. Our auric fields are partly a combination of electro-magnetic vibrations. We are constantly giving off (electrical) and absorbing (magnetic) energies, and most of the time we are not cognizant of it. Every time we come in contact with another person, there is an exchange of energy. We give them some and they give us some. Those with this totem will begin to realize and recognize this exchange much more distinctly than in the past. Trust what you feel and sense. The changes and such will be important for your own health and well being. Learning to read and interpret the aura would be beneficial. What animal has visited your awareness lately? Perhaps it is telling you something…. This entry was posted in Emotions, Health, Mind-Body Awareness, Nature, Relationships, Spirituality, Yoga and tagged animal totem, anole, chameleon, emotional trauma, intimate relationships, lizard, meditation, psychology, psychotherapy, relationships, somatic psychology, spirit guides, symbolism by AmyRxBaker. Bookmark the permalink.